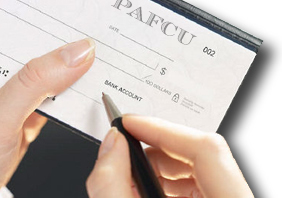 Open a checking account and earn interest on your balance daily, no service charge with a minimum balance of $800. All account with balances below $800 are charged a flat service charge of $5.00 per month. Overdraft protection is available and share transfer is also available to guard against accidental overdrafts. Direct deposit, payroll deduction and automatic drafts are accepted. Debit cards are available upon approval with no transaction fees from the Credit Union..